Ropey Rampage is the second level of Donkey Kong Country. It is also the second area of the Kongo Jungle, the game's first world. This level takes place in a jungle during a thunderstorm. Much of it involves the heroes swinging along vines over the treetops of the jungle. Besides this, the level is rather basic, and does not feature many unique foes or hazards. However, Armies and Zingers are found here many times, and add a challenge to this early level. Followed by these two foes are Kritters, who appear all around the level, but do not serve as a very dangerous hazard. As the Kongs reach the end of this level, the storm ends, revealing a sunrise in the background. 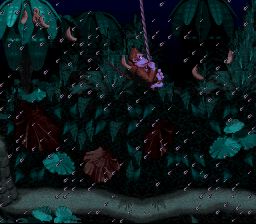 In the Game Boy Color remake of Ropey Rampage, there is no tropical storm, making it rather nighttime. 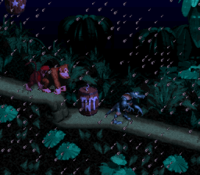 In the Game Boy Advance remake of Ropey Rampage, the background is lighter and instead of a tropical storm, it is a rainstorm, making the screen easier to see. Donkey Kong travels towards a TNT Barrel and a Kritter. At the beginning of the level, the primates emerge from a tunnel onto a straight pathway leading to a pair of Armies and a TNT Barrel. Raised areas of land are behind this path, holding bananas and a Kritter. The letter K hovers to the right of this foe. Farther ahead, they can find a rope hanging by the edge of a cliff. They can use it to reach the treetops, where another Army is present. An area of land follows a gap after the trees with a trio of Kritters and another raised piece of land on it. The heroes can reach the top of it, where the first DK Barrel is located, if they climb a nearby rope. A wide alcove is ahead with a rope above it. An Animal Token is present on a treetop behind the rope, which can be used to swing over the alcove. If the primates travel to the east from here, they can find an Army at the edge of a cliff and a rope that is able to swing them over an abyss and onto the treetops, where the letter O is placed. Two trees next to the letter carry a Kritter. A wide pit follows these trees, but the duo can swing over it with a rope. Once they cross the abyss, they find themselves on solid ground, where the level's Star Barrel is located. A TNT Barrel and a Kritter stand in the area after the barrel. The heroes can find a pair of Armies and a TNT Barrel nearby in a wide alcove with a few ropes above it. They can swing over the foes with these ropes. Another alcove is ahead, containing a raised piece of land with the next Army on it. A DK Barrel wobbles below it. A straight pathway nearby leading to an abyss holds a marching Kritter. This abyss can be crossed with the use of a rope. The Kongs reach a single treetop with a Kritter on it on the opposite side of the pit. A larger pit follows that must be crossed with the aid of two more ropes. They come up to one of the two letter N's in the level as they swing. A Zinger that moves in a vertical path flies in their way as they cross. Once the primates access the solid piece of land after the foe, they can find a spot in the ground that they can break to reveal a tire. There is a small, raised piece of land near here, which has a part of the ground that can be broken open to release an Animal Token of Winky. It is followed by an abyss with several ropes above it. One of Two Zingers fly between each of the ropes, which they must swing on to cross. Once they pass this abyss, the two friends land on a small platform with a Kritter on it. A gap is ahead, and once they pass it, they can find a sign that indicates that the level is almost complete. The straight pathway ahead of here leads to an Army and an exit sign with a tunnel after it. A tree above this area holds the letter G. Once the tunnel is entered, the level is completed. K: The letter K is found next to the first Kritter in the level to the right of a high platform. O: The letter O can be found above a pair of two trees after swinging from the second rope of the level. N: For reasons unknown, two N letters are found in this level. The first is located at the end of the first Bonus Level, and the other can be reached after swinging from two ropes near a single Kritter. G: The letter G is at the end of the level above the exit sign of the level on top of a tree. Immediately after the letter O, the Kongs should fall into a small abyss. If they do so, they end up in a Barrel Cannon, which shoots them through a wall and into the Bonus Level. There, they must shimmy along several ropes, collecting many bananas, as well as the letter N. Once done with this, they are able to exit the area by walking into a nearby opening. When they arrive back in the main level, they are shot out past ropes and a single Zinger. 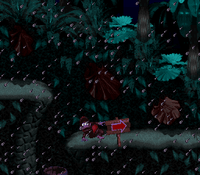 Just as the storm in the level ends, the Kongs must hop over a very tiny abyss near a sign. If they turn around after the pit and then walk into it, they should land in a barrel. It blasts them into the Bonus Level, where they must watch an Extra Life Balloon as it moves around four barrels. Once it stops, the Kongs are put up to the challenge of finding which barrel the balloon is in, only with one try. If they choose correctly, they are awarded with the Extra Life Balloon and are then taken out of the bonus. If they fail to choose correctly, they are forced out of the special stage without a prize. Instead of climbing up the first rope in the level, the Kongs should jump into the abyss ahead of it to land in a Warp Barrel that leads them near the end of the level, where they can find a sign indicating that the level is almost over. This warp can only be found in the Game Boy Advance version of the game. In the Game Boy Color version of the game, the second Bonus room (with the Extra Life Balloon Mini game) contains a different sprite for the background graphics. The tree branches in the upper left and right corners look much more different than the usual tree graphics. It marks the only appearance of this specific adornment in the game. This page was last edited on April 18, 2019, at 18:48.